"The Kick-Off Meeting for the Front Skate Park Project will be held on Wednesday November 14th from 6:00-8:00 PM at the North Dale Community Center multi-purpose room. The City of Saint Paul will be working with ASD + Stantec throughout the Skate park design process. The first meeting will begin with introductions and an overview of the project. 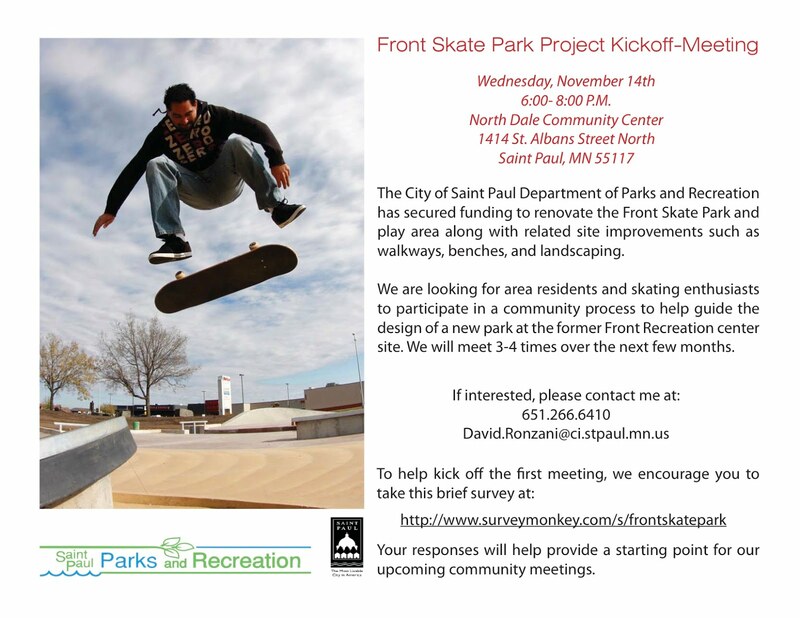 Then, a consultant from ASD + Stantec along with Saint Paul parks design staff will lead a public workshop where both skaters and community members will work together to create a vision of what they want the new skate park to become. Thanks to everyone who participated in the online survey, we received a lot of great information. I included the meeting invite as an attachment. If you have any questions or want to be removed from this mailing list, please contact me." Sorry for the short heads up. The meeting is tomorrow, if you can make it, go have your say. The plan is to build a new plaza on top of that foundation that's next to the water fountains and bathrooms at Front. The current skatepark will be removed and turned into a playground. At the meeting we split into groups and made little scaled layouts of what we want in the park. From what I could tell, the kids seemed really hyped on having ledges along with stairs, and some good flow throughout the park...so it's off to a good start. There's going to be 2 more public input sessions, but I'm not sure of the dates yet. Estimated date of completion: late fall of 2013.
just out of curiosity... why wouldn't you just leave the current park as is - sense they already payed to have it there? that confuses me... it could be a good opportunity to have separate spaces in the same zone. possible creating more space in both parks so they aren't as congested, just a thought. thanks for the info though! hyped none the less! If they turn what the skatpark is now into a playground would the new construction limit to just the space by the water fountains? I personaly think that the skate park now should be romoved and the patch of flat ground by the fountains should be connected the the old skate parks area ...that would help with the space issues.